Landmark exhibition examines artistic exchanges among Johannes Vermeer & his contemporaries from mid-1650s to around 1680, when they reached height of their technical ability & mastery of genre painting, or depictions of daily life. This landmark exhibition examines the artistic exchanges among Johannes Vermeer and his contemporaries from the mid-1650s to around 1680, when they reached the height of their technical ability and mastery of genre painting, or depictions of daily life. The introduction of quiet scenes unfolding in private household spaces and featuring elegant ladies and gentlemen was among the most striking innovations of Dutch painting of the Golden Age, a time of unparalleled innovation and prosperity. The exhibition brings together nearly 70 works by Vermeer and his fellow painters, including Gerard ter Borch, Gerrit Dou, Pieter de Hooch, Gabriel Metsu, Frans van Mieris, Caspar Netscher, and Jan Steen, who lived in various towns throughout the Dutch Republic, from Delft and Deventer to Amsterdam and Leiden. Juxtaposing paintings related by theme, motif, and composition, the exhibition explores how these artists inspired, rivaled, surpassed, and pushed each other to greater artistic achievement. 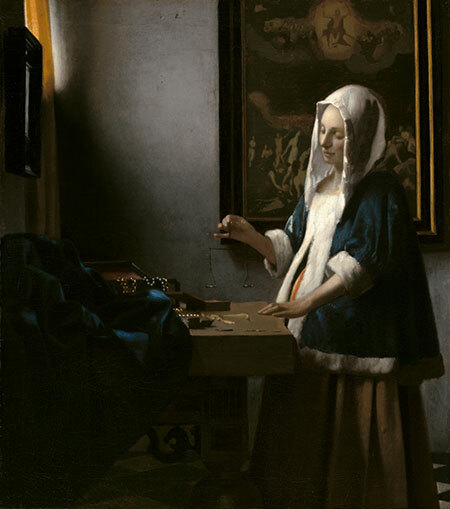 The exhibition features 10 paintings by Vermeer (many of which have not been seen in the United States since the Gallery’s 1995–1996 exhibition Johannes Vermeer), including The Lacemaker (c. 1669–1670, Musée du Louvre, Paris) and The Love Letter (c. 1669–1670, Rijksmuseum, Amsterdam). A fully illustrated catalog features essays by the curators and essays and entries by a team of international scholars. This exhibition is curated by Arthur K. Wheelock Jr., curator of northern baroque paintings, National Gallery of Art, Washington; Dr. Adriaan Waiboer, head of collections and research, National Gallery of Ireland, Dublin; and Blaise Ducos, curator of Dutch and Flemish paintings, Musée du Louvre, Paris. To learn more, or view the special videos, CLICK HERE.